When sail was swift. Pallada in Nagasaki (1854; no artist given), from A World of Empires. Summer brings thoughts of seasides and sailing. For landlubbers, some beach reading. Barons of the Sea, by Steven Ujifusa ’01 (Simon & Schuster, $29.99), chronicles an age of technological innovation, sharp competition, and the rise of new fortunes: the nineteenth-century scrum to build and deploy the fastest clipper ships for the (you guessed it) China trade. 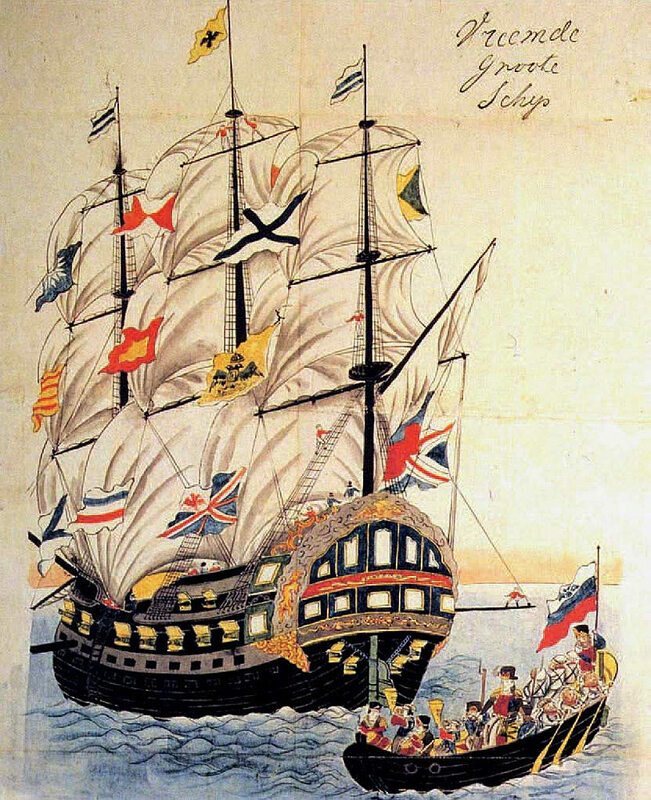 In A World of Empires: The Russian Voyage of the Frigate Pallada, by Edyta M. Bojanowska, Ph.D. ’02 (Harvard, $35), a Yale professor of Slavic languages and literatures harvests a novelistic account of the Russian mission, hard on the heels of Commodore Matthew Perry, to open trade with Japan, vividly illuminating a world of commerce half way around the world from Ujifusa’s barons. With statecraft and statesmanship currently in short supply, biographies can be a useful reminder of what’s missing. Zbigniew Brzezinski: America’s Grand Strategist, by Justin Vaïsse (Harvard, $35), accounts for the life and work of the late national security adviser, Ph.D. ’53 (an immigrant who did rather well), who engaged with all the major issues from the Cold War and the Middle East through the rise of China. From a different era, The Reformer, by Stephen F. Williams, J.D. ’61 (Encounter Books, $29.99), brings back the struggle of Vasily Maklakov, a lawyer and Duma member, who tried to effect liberal reforms as authoritarians of the right and left (tsarists and Leninists) set Russia’s course in the early twentieth century. The author, on the U.S. Court of Appeals for the D.C. Circuit, is well placed to appreciate the rule of law. Calculated Values: Finance, Politics, and the Quantitative Age, by William Deringer ’06 (Harvard, $45). “We live in a quantitative age,” writes the author, an historian of science perched at MIT—you know, if it can be counted, it counts. But how did this come to be so? Digging into the England of the late 1600s and early 1700s, he reveals the sharp political calculations, alongside advances in natural history and finance, that changed the vocabulary of public, and other, discourse. Rebel Talent, by Francesca Gino, Tandon Family professor of business administration (Dey Street/Morrow, $27.99), makes the case for those who “break the rules at work and in life.” In other words, there is a scholarly basis for being disruptive (within bounds!) to effect change in organizations. Lest those who think rebelling is all fun and games celebrate, the chapter on “Becoming a Rebel Leader” suggests a weightier fate. A more sober take on a related subject is How Change Happens: Why Some Social Movements Succeed While Others Don’t, by Leslie R. Crutchfield ’91, M.B.A. ’01 (Wiley, $30), now at Georgetown’s business school. She studies movements from marriage equity to gun-rights expansion to tease out the changes in social attitudes, grass-roots organizing, and other elements essential to effecting change. The second novel by professor of the practice of literary criticism and New Yorker book critic James Wood follows a family of Anglo intellectuals Upstate (Farrar, Straus and Giroux, $26), to check in on a depressed adult daughter. In alert and halting prose, Wood channels the Querrys’ loving anxiety—and also the paper-thin tranquility of their surroundings: Saratoga Springs in late winter, and America in pre-recession 2007, with a young Senator Barack Obama on the rise. The Chernobyl nuclear power plant a few weeks after the disaster. In many respects, the fallout lingers. Chernobyl: The History of a Nuclear Catastrophe, by Serhii Plokhii, Hrushevs’kyi professor of Ukrainian history (Basic, $32). An accessible account of the disaster (one of many, from before World War II through the present tense military skirmishes) visited on Ukraine. The author, who was a student there at the time, weaves together personal stories, the Communist institutional context, and the fallout, literal and metaphorical, from April 26, 1986. Unequal and Unrepresented: Political Inequality and the People’s Voice in the New Gilded Age, by Kay Lehman Schlozman, Henry E. Brady, and Sidney Verba, Pforzheimer University Professor emeritus (Princeton, $29.95). Prompted by a chance observation that the Hearst Castle in San Simeon dated from one Gilded Era, and the recent excresence of megamansions from a new, continuing one, the authors joined forces anew to build upon their two prior landmark books on the direct connections between income and wealth disparities and rising inequalities in political voice (driven, of course, by rich people’s application of their wealth to the conduct of the public’s business). If writing, rather than reading, is your summer thing, Chance Particulars, by Sara Mansfield Taber, Ed.D. ’87 (Johns Hopkins, $19.95 paper), is a “writer’s field notebook” to guide and structure your observations before you get back inside, to the drudgery of drafting and revising.